Sistem Informasi mungkin produk-produk dari para developer PHP yang masih menjanjikan untuk ditawarkan dan diteruskan pengembangannya. Bagi kamu yang sedang mencari-cari referensi belajar terkait Sistem Informasi dengan PHP, berikut adalah 3 Sistem Informasi dengan PHP yang Bisa Kita Contoh di Github. Sebenarnya jumlah sistem informasi yang bisa dicontoh dari repo Github sangat banyak, namun disini hanya ditampilkan 3 saja, yang bisa kita ambil dengan kriteria jumlah fork dan rating yang tinggi. SIMDESA atau Sistem Informasi Surat-menyurat dan Kependudukan Pada Pemerintah Desa adalah sebuah sistem informasi yang membantu pengelolaan surat menyurat, pengelolaan data kependudukan di pemerintah desa. Simdesa ini dikembangkan oleh Pandigresik di Github. Sudah di fork oleh 32 orang dan mendapat bintang rating dari 10 orang loh. Pengembangannya termasuk sangat aktif, bahkan saat tulisan diterbitkan, mereka baru saja melakukan commit di reponya! SISMAR atau Sistem Informasi Marketing sederhana adalah sistem informasi yang membantu pengelolaan kegiatan marketing sebuah produk secara sederhana. Sistem yang dikembangkan menggunakan HMVC CodeIgniter ini sudah di fork lebih dari 25 orang dan mendapat 7 bintang dari pengguna Github. Sourcecode dan repo githubnya bisa dilihat disini: https://github.com/codetrash/sismar. 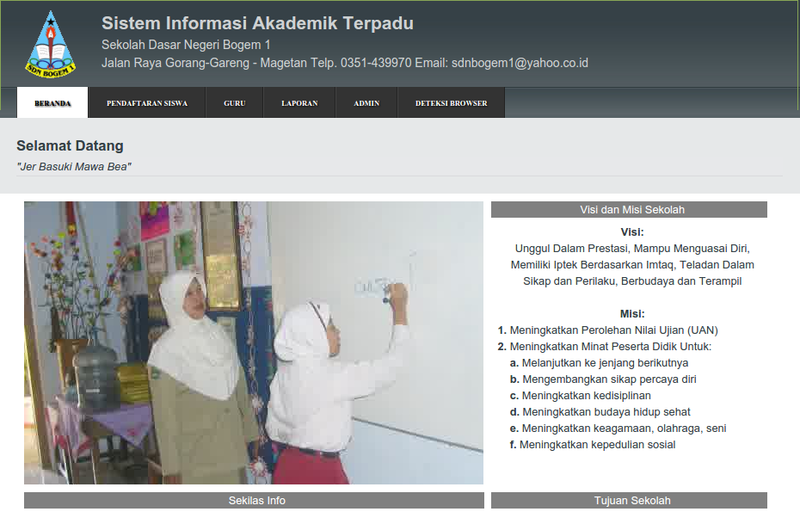 SIATUSD adalah sistem informasi terpadu untuk Sekolah Dasar. Tentunya karena diperuntukan untuk sekolah dasar, maka fitur-fiturnya tidak jauh dari pengelolaan pendidikan dan sarana prasarana di SD. Sistem yang dibangun dari CodeIgniter 2.1.x oleh mas Zainal Abidin ini telah mendapat 7 fork dan 2 tanda bintang dari pengguna Github loh. Dengan adopsi PHP yang luar biasa, kita bisa dengan mudah mendapati script atau snippet bertebaran di beberapa situs penampil source code gan. Akan tetapi, bertebarannya script atau snippet itu tidak dilengkapi filter mana yang sudah jadi best practice mana yang belum. Iya, suka tidak suka, banyak juga source code yang asal ditulis. PHP is more famous Website Development Technologies among Web Programmers. More than 50% Website or Web Application using or developed in PHP. Framework is really help in development as compare core development, framework provides every web developer base skeleton or foundation for build strong web application. Every Framework has own Advantages and Disadvantages based on its feature and coding method. In this post we are trying to briefly most famous PHP Framework based on easy for installation and coding, most acceptable by the on-line community or help-desk, Code reference availability on internet, inbuilt feature helps in development, stability, maintainability and upgradeability in Web Development, Here we are trying to introduce The Best PHP Framework for 2015. 1. Laravel: Laravel The PHP Framework for Web Artisans and one of the best php framework in year 2014. Laravel is powerful feature like Restful routing, Composer Powered, Beautiful inbuilt templating (Blade template) and expressive syntax etc. 2. Yii Framework: Yii Framework is fast, secure, stable, high performance php framework for developing Web 2.0 applications. Yii2 provided basis and advanced application installation based on requirement. Yii Framework comes with Rich Feature Layered caching scheme, Model-View-Controller (MVC) design pattern, Database Access Objects (DAO)/ Active Record, I18N/L10N, Role based access and authentication, Gii (automatic code generation) crud generator module, AJAX-enabled widgets, Detailed documentation, Easily integrated third party code and system etc. Yii is ideal framework for develop social media, enterprizes web application, SAAS, PAAS etc. 3. Zend Framework: No doubt about Zend Framework in this list and top 3 possible because it is flexible architecture and widely acceptable for enterprises web application development. 5. CakePHP: Cakephp is one of oldest PHP Framework build by Polish programmer Michal Tatarynowicz inspiring by Ruby on Rails in April 2005. Scratch, Hot Scripts and Croogo CMS made in Cakephp. 6. Symfony: Symfony Framework is focus to set of reusable PHP Components for Enterprises Web Projects. Drupal, phpBB, Laravel, OROCRM and PIWIK etc. using symfony. 7. Phalcon: Phalcon is open source, high performance web application framework for PHP. It implemented C extension for optimize performance to goal of handle more requests per second than other PHP Frameworks. Phalcon has all the feature which might make it No. 1 PHP Framework as Compare Laravel. 8. FuelPHP: FuelPHP is open source HMVC PHP Framework. 9. Kohana: Kohana is easy, light weight and easy to use HMVC PHP Framework. 10. Prado: Prado name acronym from “PHP Rapid Application Development Object-oriented”. It is started by Qiang Xue inspired by Apache Tapestry. Based on Prado experience Qiang Xue developed Yii Framework. Prado first initial release was in June 2004. 11. Slim: Slim is light weight micro php framework help for quick write simple application and APIs. 12. Flight: Another fast, extensive micro php framework, simple and easy to use PHP Framework for build Restful PHP Web Applications. 13. Webasyst: Webasyst is help for team work, collaborate, building website and stores. 14. PHPixie: New light weight PHP Framework and a fork of Kohana Framework. 15. Aura: Aura PHP Framework provides light weight, well-tested, decoupled libraries and standards-compliant. 16. Medoo: Medoo is one of the lightest database framework. 17. Yaf: Yet Another Framework is first MVC Framework which written in C and build as PHP Extension. 18. Silex: A Concise, Extensible, Testable Micro PHP Framework based on the Symfony2 Components. 19. Agavi: Agavi is simple, scalable, powerful PHP MVC Framework. 20. Nette: Nette Framework is developed by David Grudl, an open source PHP Framework. There is another PHP Framework eg. Guzzle PHP, LIMONADE, Pop PHP etc.